Omar Khayyam was born at Naishapur in Khorassan in the latter half of our Eleventh, and died within the First Quarter of our Twelfth Century. The Slender Story of his Life is curiously twined about that of two other very considerable Figures in their Time and Country: one of whom tells the Story of all Three. This was Nizam ul Mulk, Vizier to Alp Arslan the Son, and Malik Shah the Grandson, of Toghrul Beg the Tartar, who had wrested Persia from the feeble Successor of Mahmud the Great, and founded that Seljukian Dynasty which finally roused Europe into the Crusades. This Nizam ul Mulk, in his Wasiyat - or Testament - which he wrote and left as a Memorial for future Statesmen - relates the following, as quoted in the Calcutta Review, No. 59, from Mirkhond's History of the Assassins. 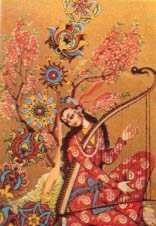 "Omar Khayyam also came to the Vizier to claim his share; but not to ask for title or office. 'The greatest boon you can confer on me,' he said, 'is to let me live in a corner under the shadow of your fortune, to spread wide the advantages of Science, and pray for your long life and prosperity.' The Vizier tells us, that when he found Omar was really sincere in his refusal, he pressed him no further, but granted him a yearly pension of 1200 mithkals of gold from the treasury of Naishapur. "When the Malik Shah determined to reform the calendar, Omar was one of the eight learned men employed to do it; the result was the Jalali era (so called from Jalal-ud-din, one of the king's names) - 'a computation of time,' says Gibbon, 'which surpasses the Julian, and approaches the accuracy of the Gregorian style.' He is also the author of some astronomical tables, entitled 'Ziji-Malikshahi,' and the French have lately republished and translated an Arabic Treatise of his on Algebra. "'It is written in the chronicles of the ancients that this King of the Wise, Omar Khayyam, died at Naishapur in the year of the Hegira, 517 (A.D. 1123); in science he was unrivaled, - the very paragon of his age. Khwajah Nizami of Samarcand, who was one of his pupils, relates the following story: "I often used to hold conversations with my teacher, Omar Khayyam, in a garden; and one day he said to me, 'My tomb shall be in a spot where the north wind may scatter roses over it.' I wondered at the words he spake, but I knew that his were no idle words.*4. Years after, when I chanced to revisit Naishapur, I went to his final resting-place, and lo! it was just outside a garden, and trees laden with fruit stretched their boughs over the garden wall, and dropped their flowers upon his tomb, so that the stone was hidden under them." Thus far - without fear of Trespass - from the Calcutta Review. The writer of it, on reading in India this story of Omar's Grave, was reminded, he says, of Cicero's Account of finding Archimedes' Tomb at Syracuse, buried in grass and weeds. I think Thorwaldsen desired to have roses grow over him; a wish religiously fulfilled for him to the present day, I believe. However, to return to Omar. Though the Sultan "shower'd Favors upon him," Omar's Epicurean Audacity of Thought and Speech caused him to be regarded askance in his own Time and Country. He is said to have been especially hated and dreaded by the Sufis, whose Practise he ridiculed, and whose Faith amounts to little more than his own, when stript of the Mysticism and formal recognition of Islamism under which Omar would not hide. Their Poets, including Hafiz, who are (with the exception of Firdausi) the most considerable in Persia, borrowed largely, indeed, of Omar's material, but turning it to a mystical Use more convenient to Themselves and the People they addressed; a People quite as quick of Doubt as of Belief; as keen of Bodily sense as of Intellectual; and delighting in a cloudy composition of both, in which they could float luxuriously between Heaven and Earth, and this World and the Next, on the wings of a poetical expression, that might serve indifferently for either. Omar was too honest of Heart as well of Head for this. Having failed (however mistakenly) of finding any Providence but Destiny, and any World but This, he set about making the most of it; preferring rather to soothe the Soul through the Senses into Acquiescence with Things as he saw them, than to perplex it with vain disquietude after what they might be. It has been seen, however, that his Worldly Ambition was not exorbitant; and he very likely takes a humorous or perverse pleasure in exalting the gratification of Sense above that of the Intellect, in which he must have taken great delight, although it failed to answer the Questions in which he, in common with all men, was most vitally interested. Why, who art Thou to teach, and He to learn?" That One for Two I never did misread." The Reviewer,*6 to whom I owe the Particulars of Omar's Life, concludes his Review by comparing him with Lucretius, both as to natural Temper and Genius, and as acted upon by the Circumstances in which he lived. Both indeed were men of subtle, strong, and cultivated Intellect, fine Imagination, and Hearts passionate for Truth and Justice; who justly revolted from their Country's false Religion, and false, or foolish, Devotion to it; but who fell short of replacing what they subverted by such better Hope as others, with no better Revelation to guide them, had yet made a Law to themselves. Lucretius indeed, with such material as Epicurus furnished, satisfied himself with the theory of a vast machine fortuitously constructed, and acting by a Law that implied no Legislator; and so composing himself into a Stoical rather than Epicurean severity of Attitude, sat down to contemplate the mechanical drama of the Universe which he was part Actor in; himself and all about him (as in his own sublime description of the Roman Theater) discolored with the lurid reflex of the Curtain suspended between the Spectator and the Sun. Omar, more desperate, or more careless of any so complicated System as resulted in nothing but hopeless Necessity, flung his own Genius and Learning with a bitter or humorous jest into the general Ruin which their insufficient glimpses only served to reveal; and, pretending sensual pleasure, as the serious purpose of Life, only diverted himself with speculative problems of Deity, Destiny, Matter and Spirit, Good and Evil, and other such questions, easier to start than to run down, and the pursuit of which becomes a very weary sport at last! With regard to the present Translation. The original Rubaiyat (as, missing an Arabic Guttural, these Tetrastichs are more musically called) are independent Stanzas, consisting each of four Lines of equal, though varied, Prosody; sometimes all rhyming, but oftener (as here imitated) the third line a blank. Somewhat as in the Greek Alcaic, where the penultimate line seems to lift and suspend the Wave that falls over in the last. As usual with such kind of Oriental Verse, the Rubaiyat follow one another according to Alphabetic Rhyme - a strange succession of Grave and Gay. Those here selected are strung into something of an Eclogue, with perhaps a less than equal proportion of the "Drink and make-merry," which (genuine or not) recurs over-frequently in the Original. Either way, the Result is sad enough: saddest perhaps when most ostentatiously merry: more apt to move Sorrow than Anger toward the old Tentmaker, who, after vainly endeavoring to unshackle his Steps from Destiny, and to catch some authentic Glimpse of TO-MORROW, fell back upon TO-DAY (which has outlasted so many To-morrows!) as the only Ground he had got to stand upon, however momentarily slipping from under his Feet. 1. 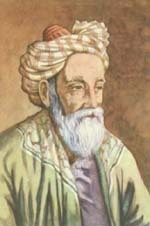 Some of Omar's Rubaiyat warn us of the danger of Greatness, the instability of Fortune, and while advocating Charity to all Men, recommending us to be too intimate with none. Attar makes Nizam-ul-Mulk use the very words of his friend Omar [Rub. xxviii. ], "When Nizam-ul-Mulk was in the Agony (of Death) he said, 'Oh God! I am passing away in the hand of the wind.'" 2. Though all these, like our Smiths, Archers, Millers, Fletchers, etc., may simply retain the Surname of an hereditary calling. 3. Philosophe Musulman qui a vecu en Odeur de Saintete dans sa Religion, vers la Fin du premier et le Commencement du second Siecle," no part of which, except the "Philosophe," can apply to our Khayyam. 4. The Rashness of the Words, according to D'Herbelot, consisted in being so opposed to those in the Koran: "No Man knows where he shall die." - This story of Omar reminds me of another so naturally - and when one remembers how wide of his humble mark the noble sailor aimed - so pathetically told by Captain Cook - not by Doctor Hawkworth - in his Second Voyage (i. 374). When leaving Ulietea, "Oreo's last request was for me to return. When he saw he could not obtain that promise, he asked the name of my Marai (burying-place). As strange a question as this was, I hesitated not a moment to tell him 'Stepney'; the parish in which I live when in London. I was made to repeat it several times over till they could pronounce it; and then 'Stepney Marai no Toote' was echoed through an hundred mouths at once. I afterwards found the same question had been put to Mr. Forster by a man on shore; but he gave a different, and indeed more proper answer, by saying, 'No man who used the sea could say where he should be buried.'" 5. Since this paper was written" (adds the Reviewer in a note), "we have met with a Copy of a very rare Edition, printed at Calcutta in 1836. This contains 438 Tetrastichs, with an Appendix containing 54 others not found in some MSS."